For the seventh consecutive year, we have surveyed a panel of over 100 global financial services leaders for their thoughts on retail banking and credit union trends and predictions. The crowdsource panel includes bankers, credit union executives, industry analysts, advisors, authors and fintech followers from Asia, Africa, North America, South and Central America, Europe, the Middle East and Australia. We used the findings from our panel as the foundation to develop a global survey of executives involved in the financial services industry which provided a prioritization of our trends. Our global survey also provided an opportunity to do an end-of-year review of last year’s projections. 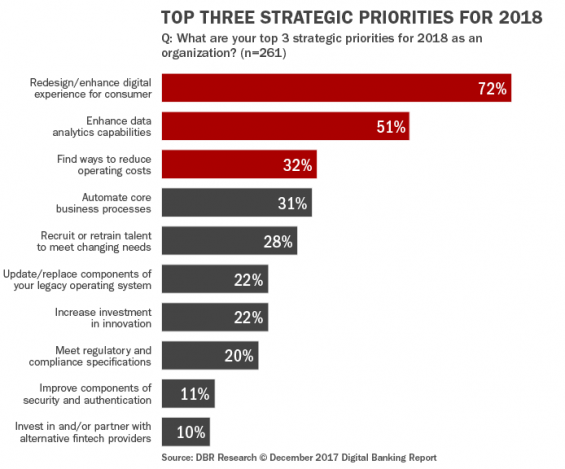 Finally, the survey collected insight into strategic priorities for 2018 and the fintech players that the industry believes will have the greatest impact in the upcoming year. By collecting insights from leading influencers, ranking the trends using an industry survey, and including extensive analysis around each trend, we have developed the most comprehensive annual trend report in the banking industry. 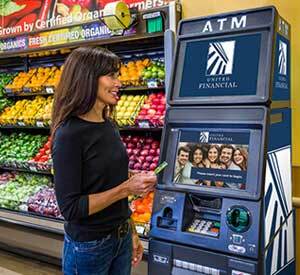 For the third consecutive year, the research, analysis and Digital Banking Report entitled, 2018 Retail Banking Trends and Predictions, are sponsored by Kony, Inc.. The ranking of the top 10 trends and predictions was done by providing a list of trends identified by our crowdsourced panel and asking banks, credit unions and the supplier community globally to provide their top 3 predictions for 2018. Of the organizations that provided their top 3 trends, the highest ranking prediction was that the industry was going to remove friction from the customer journey (61%). The next two most mentioned trends were the improved use of data and advanced analytics, and refinements in multichannel delivery (mentioned by 57% and 42% respectively). Interestingly, with the exception of one trend (testing and use of blockchain technology), the trends and order of these trends were the same as last year. Last year’s trend of investment in innovation did not make the top 10 this year. The importance and underlying components of each trend differed in this year’s research compared to the predictions for 2017. 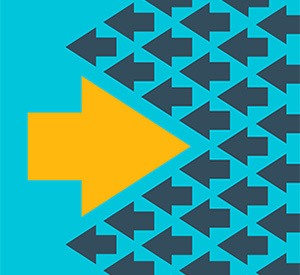 Regarding changes in emphasis for this year’s trends, removing friction from the customer journey increased in importance from last year, with 61% of organizations placing this trend in the top three, compared to 54% last year. The trend around the use and application of data also increased in importance from last year, with 57% of those surveyed placing this in the top 3 for 2018, compared to 53% in predictions for 2017. 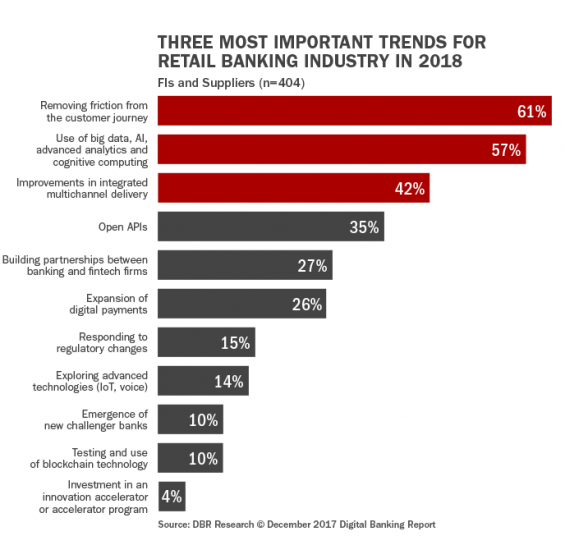 Other notable shifts of importance included a greater belief that open banking APIs would be important, less emphasis on regulatory changes and a greater belief that advanced technology would have an impact in 2018. When we asked financial services organizations worldwide about their top three strategic priorities for 2018, there was a significant change in priorities compared to last year’s research. While the order of the top three priorities remained the same as last year, the priority of reducing operating costs dropped from 41% last year to only 32% for 2018. At the same time, the priority of investment in innovation dropped from the 4th position to 7th, with the number of firms mentioning innovation falling from 26% to 22%. The biggest jumps in strategic priority in 2018 were seen with the emphasis on automating core business processes (up 13%) and recruiting talent (up 8%). 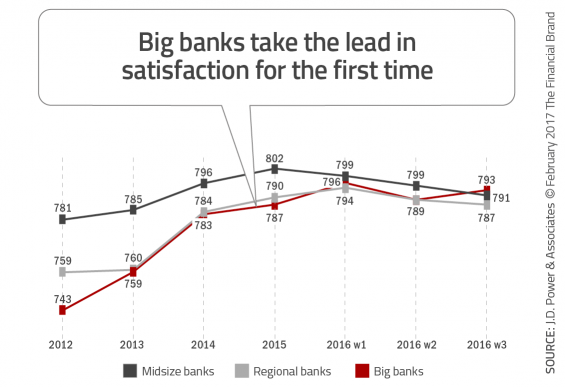 These shifts illustrate the growing importance of becoming a digital bank and the impact of this transformation on the types of employees required to address new challenges. Here is what some of our crowdsource panel had to say about 2018. 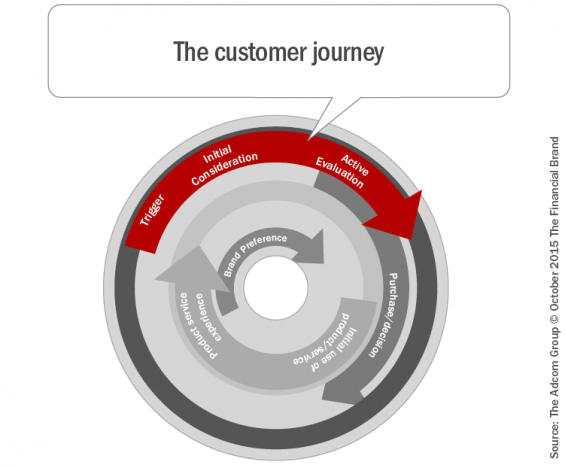 While the banking industry has talked about ‘customer-centricity’ and ‘improving the customer experience’ for decades, most organizations have had difficulty breaking down product silos or leveraging internal data to deliver a contextual digital experience. 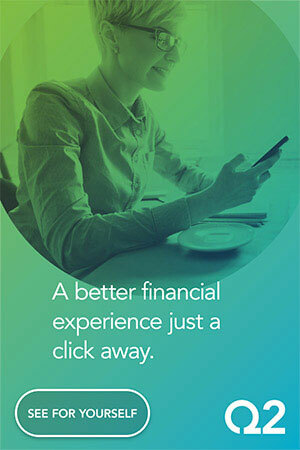 “Long-term sustainable growth in the banking industry seems only possible with a radical departure from a sales- and product-obsessed mindset to one of genuine customer centricity, and further rationalization of strategies to target the right markets, customer segments, and solutions,” states Deloitte. – Joe Sullivan, CEO of Market Insights, Inc.